Specific goals get accomplished. Know what, why and by when. So yesterday I shared my overarching goal for 2013 related to the #makeitcount campaign. 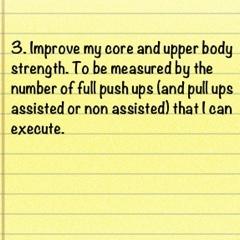 I promised to make it count by training to inspire so I’m starting by sharing these 2 goals…number 3 and number 4! Why? As women, we generally have lesser upper body strength than our male counterparts! I think a lot of us ladies are scared of looking too muscular; however, this will never happen as it’s not in our genetic make up! As an amateur poler I need that upper body strength to help me progress my tricks and continue to improve as this is an activity I would like to stay involved in. What? So, the plan is to keep an eye on my progress – check on a monthly basis how many push ups and pull ups I can do; complete a core specific workout once per week and complete an upper body specific workout once per week. Why? I think I ran my first 5k in 2009 which felt like a marathon to me then as the only running I had ever really done was as a 100m sprinter in my younger years. 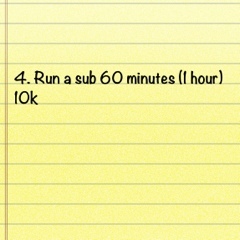 Since then, I aimed to run a 5k in under 30 minutes which I did in July 2011. After that, I signed up for my first 10k in July 2012, and my first half marathon in October 2012. Between all these races, my relationship with running has been on and off! I competed my half marathon in under 2:30 having never run the distance before. I feel though, that I need to go back to 10k and conquer that as I have only ever run that distance on 2 or 3 occasions. What? So, the plan is to run 10k at least once per month; interval training twice per month; take part in a 5k race; take part in a 10k race and continue to work my way through the green level on Nike+. So, not buts! What are your goals for 2013?? P.S. Put your name and email in the form on the right for more cool fitness tips, tricks and secrets. Also leave me your thoughts, comments and questions below.